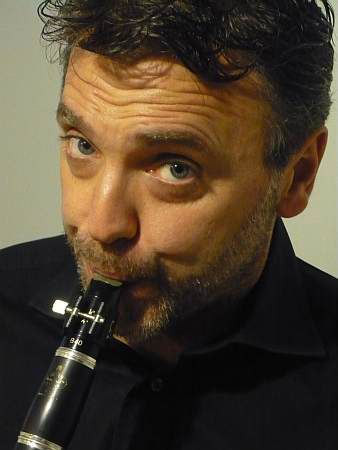 Young diploma in clarinet with the highest marks, stands now in major international competitions in Genoa, Rome, Palmi, Ancona, Turin, Stresa, Martigny, Colmar and Paris. A 20-year-old first clarinet soloist in the Orchestra Sinfonica della RAI di Torino and the Philharmonic in the same city, a post he held continuously until 1994 and, a decade later, in ‘Orchestra of the Fondazione Arena di Verona. He has dedicated himself to teaching at the conservatories of parallel state, the School of High Musical Specialization and Master Class in Saluzzo Italy, France, Spain and Canada, as well as chamber music, in a rich production of concerts and recordings. He has been actively following Conducting symposiums and phenomenology of music with renowned masters such as Carlo Maria Giulini Celibidache and Serghiu. His intense artistic activity allowed him to collaborate with the greatest conductors and composers of our time: Solti, Bernstein, Levine, Rostropovich, Lorin Maazel, Temirkanov, De Burgos, Muti, Pretre Sawallich, Giulini, Mehta, Chailly, Sinopoli, Oren , Lombard, Berio, Boulez, Donatoni, Rutter, Battistelli and Vacchi. E ‘was chosen by G. Bertini to serve as the clarinet soloist with the Philharmonic Orchestra of Lisbon and S. Celibidache for a major tour with the Orchestre Schleswig-Holstein. Thanks to its vast repertoire, has performed as soloist in prestigious international festivals: Venice Biennale and Zagreb, the Mozart Festival in Prague, September Musicale di Torino, Festival d’Automne in Paris, Panathenaic, Alicante Festival and Aix-en- Provence, Samobor and Alba Music Festival, International Festival of the Arts in New York and St. Petersburg Palaces, River Concert of Maryland and Schoenberg Center in Vienna and in the concert halls of Rome (RAI, University Institute of Music and the Lateran Palace), Zagreb (Vatroslav Lisinski Hall and Croatian Chamber Orchestra), Naples (Maggio Musicale), Padova (Venetian Soloists), Hamilton (National Orchestra of Canada), L’Aquila (Solisti Aquilani), Bangkok (Thailand Philharmonic), Verona (Theatre Philharmonic) , St. Petersburg (State Hermitage Orchestra), Salerno (Teatro Verdi), Monaco (Chamber Orchestra), Pordenone and Trieste (Teatro Verdi), Torino (RAI and Philharmonic Orchestra), Tubingen (Kiev Philharmonic Chamber Orchestra), Reggio Calabria (Theatre Chile), performing works by Mozart, Salieri, Donizetti, Mercadante, Ponchielli, Weber, Rossini, Strauss, Bruch, Debussy, Copland, Finzi, Berio, Bernstein, Shaw and the first performances of concertos Vacchi, Glue, and Galante Bacalov. Great success of its recent investments by playing the Mozart concerto with the New England Symphony at Carnegie Hall, the Philarnonia Sudecka in Krakow, the ‘Beijing Philharmonic Orchestra, the Philharmonic Orchestra of Toulon, the Orchestra’ Estado of Mexico and the Athens State Orchestra; Weber concertos accompanied by the Sofia Philharmonic, Jerusalem, Lisbon and Belgrade, the Copland Concerto with the Israel Raanana Symphonette, the Kiev Philharmonic, the Montreal Chamber Orchestra and the Camerata Bohemica Prague Variations from Rossini and Mercadante’s Concerto with the Moscow Virtuosi, the Czech National Orchestra, the Philharmonic Orchestra of Marseille, the Sonata of Brahms / Berio with the SFO Toronto and Württembergische Philharmonic, will perform again in the 2011 season, 2012 at Carnegie Hall and Lincoln Center in New York, in international festivals in Avignon, Prague, Taipei, Budapest, Montevideo, Nancy, Bratislava, Stockholm, St. Gallen, Zurich and in Italy in Catania, Bologna, Padua, Lecce, Genoa, Turin, Naples and Martina Franca.